Blog - ABCO Solar News - ABCO Solar, Inc.
On Wednesday, March 13, the Company was notified that the March 8 press release was issued premature to the final approval by the OTCQB markets. A final review is underway for certification. When final approval has been provided, the Company will issue another press release. installations and has a reputation for outstanding customer service. These qualities have allowed us to grow the business primarily through referrals, many of those based on actual customer reviews. Note: Certain statements in this news release may contain “forward-looking” information within the meaning of Rule 175 under the Securities Act of 1933 and Rule 3b-5 under the Securities Act of 1934 and are subject to the safe harbor created by those rules. All statements, other than the statements of fact, included in this press release may include forward-looking statements that involve risks and uncertainties. There can be no assurance that such statements will be accurate and actual results and future events could differ materially from those anticipated in such statements. ABCO undertakes no obligation to update forward-looking statements to reflect subsequentlyoccurring events or circumstances or to reflect unanticipated events or developments. This entry was posted in Uncategorized on March 19, 2019 by Lindsay Lucas. We raised the funds and retired the second issue of the Redstart Holdings convertible debt. Also, we have received assurance that Redstart has completed all conversions on the first of their three preferred holdings. The last ten days of closing trading prices above $0.01 and yesterdays close at over $.02 is the result of the Company’s growth and the retirement of the toxic debt. Also, we have completed the corporate actions and the applications for the Company to lift off from trading on the PINK Sheets for trading our common shares on the “Over the Counter Quality Board” (OTCQB). This level of trading will qualify our shares to trade a substantial growth of brokers and traders that do not trade on the PINK market. When it is approved, we will be trading on a quality board on OTC Markets. ABCO Energy has not traded on the OTCQB for over three years, as it has struggled to stabilize its stock price and funds. They are now staging the company for growth internally and through acquisitions to feel confident the share price will reflect this plan. This entry was posted in Uncategorized on February 25, 2019 by Lindsay Lucas. ABCO Energy, Inc (OTC PINK: ABCE) – A prosperous communication plan has rewarded ABCO Energy, Inc. with five days in a row of closing trading prices above $0.01. Due to the upspring in price, the Company filed an application for OTCQB on Monday, February 11, 2019. When it is approved, ABCO Energy, Inc. will be trading on the quality board on OTC Markets. The latest in corporate actions has helped the company to lift off from trading on PINK Sheets and driving hard to move up to the “Over the Counter Quality Board” (OTCQB). This level of trading will make shares more visible to a larger audience of brokers and traders that do not trade on the PINK market. ABCO Energy has not traded on the OTCQB for over three years as it has struggled to stabilize its stock price and fund its growth. Now staging the Company for growth internally and through acquisitions, shareholders will be confident the share price will reflect the latest in transparent communication. This entry was posted in Investor Relations, News Release, Solar Energy and tagged PINK Sheets, Stock on February 12, 2019 by Lindsay Lucas. ABCO Energy, Inc (OTC PINK: ABCED) As the leading provider of distributed solar energy in Arizona, ABCO Energy has announced Lindsay Lucas as Investor Relations Manager. She will act as a liaison between ABCO and its stockholders. "The scope of our investor relations has grown significantly over the last 5 years. Lindsay brings years of experience providing a high level of service and responsiveness to investors," said Charlie O’Dowd, President of ABCO. Prior to joining ABCO, Lindsay gained technology and business experience at both national and local ad agencies. She has held senior management roles in marketing, communications, and digital and print publishing, including Senior Copywriter at Arizona Mail Order, and Executive Director of Northern Arizona Building Association. ABCO Energy is in the Photo Voltaic (PV) solar systems industry, the LED and energy efficient lighting business and is a dealer for a solar powered air conditioning system. The Company plans to build out a network of operations in major cities in the USA to establish a national base of service operations centers. This combination of services, solar PV, solar HVAC systems and LED lighting provides the Company with a solid base in the growth markets of renewable energy applications. We currently operate in Tucson and Phoenix, Arizona and provided installation and services to other cities from our Tucson offices. The Company plan is to expand to more locations in the Western States in the next year as funding becomes available. This entry was posted in Investor Relations, Solar Energy and tagged Investor Relations, Shareholders, Solar Energy, Stock on January 21, 2019 by Lindsay Lucas. ABCO Solar, Inc. August 14, 2018, Tucson, Arizona, announced that they have signed a $950,000 commercial solar project and anticipate an additional $35,000 commercial lighting contract on the same facility with ABCO crews providing all construction. The project is on a 72-unit apartment complex and will consist of both roof top and car park shade structures. The owners will enjoy approximately $80,946 from the solar electric generation plant and $15,981 first year savings from the LED lighting project, for a total first year savings of approximately $96,927. In addition, the federal and state tax credits totaling $310,000 will further increase the owner’s return on investment. Over a period of 25 years, this project is expected to provide cost reduction for the customer in excess of $3,445,000. This is the rooftop and parking shade layout of the Arizona Solar Project sold by ABCO. ABCO Solar is in the Photo Voltaic (PV) solar systems industry, the LED and energy efficient lighting business, is a dealer for a solar powered air conditioning system. The Company plans to build out a network of operations in major cities in the USA to establish a national base of service operations centers. This combination of services, solar PV, solar HVAC systems and LED lighting provides the Company with a solid base in the growth markets of renewable energy applications. On July 1, 2018, we operated in Tucson, Arizona and provided installation and services to other cities from our Tucson offices. The Company plan is to expand to more locations in North America in the next year as funding becomes available. This entry was posted in News Release on August 14, 2018 by Charia Underwood. Below is an article by the Arizona Daily Star regarding ABCO Solar’s partnership with EXOrac. If you missed it the paper you can read it below. ABCO Solar, a Tucson- based solar energy and efficiency lighting company, has been chosen as the western United States assembler of the PWRstation mobile solar micro grid system. The photovoltaic system can be deployed in the field and be operational in less than 30 minutes. The assembly process uses an 'EXOrac' metal frame system that will be delivered to ABCO's Tucson assembly facility and then solar panels will be installed and wired, matched to an inverter that converts direct current to alternating current. The system is shipped to buyers throughout the Western Hemisphere and can also be joined with battery- storage technologies to provide a power source that is operational day and night. This entry was posted in News Articles on December 21, 2017 by Charia Underwood. ABCO Solar Inc. of Tucson, Arizona won “The Most Innovative Product” award at the Southern Arizona Home Builders Association home show in mid October. ABCO Solar (ABCO) was selected from 12 applicants as presenting “The Most Innovative Product” award for their presentation of the Perfectly Green Corporation’s SMART FROG 23 SEER Solar Air Conditioning unit. The Southern Arizona Home Builders Association (SAHBA) biannual home show features businesses involved in all aspects of home building, design and accessories and attended by 20,000 community members. The home show judges were all home building industry participants and “The Most Innovative Product” award is the most prestigious of the awards presented. Designed For Reliable On or Off Grid (FROG) applications, the Smart Frog A/C operates on 4 kilowatts of Direct Current electricity generated by solar panels. The 3 or 5 ton units can be operated using grid power, solar power or power from an integrated 7 kilowatt propane or natural gas generator. The electricity sources can be combined for power mixing which can be useful for peak time of use period “peak shaving”, powering the air conditioner in times of grid failure as well as household power needs in the absence of grid power. The integrated solar inverter and gas generator may be purchased separately as component parts if desired. The Smart Frog may use solar that is already in place on the residence. Commercial grade solar Air Conditioners will be available soon. This entry was posted in Uncategorized on October 26, 2017 by Charia Underwood. The greatest challenge for mankind in the 21st century is powering the planet, while at the same time drastically reducing carbon emissions and continuing to lower the cost of energy. One year ago, GE published a Ecomagination report that examined the incredible acceleration of renewable energy development across the globe. We called upon businesses, investors and governments to further accelerate renewable energy innovation, build new solutions and create a truly sustainable energy ecosystem for the planet, its people and the world economy. Over the course of the year we learned that our optimism was well-grounded. Some striking facts and figures — In 2016, wind and solar beat investment in fossil fuels by 2-to-1. Global capacity additions increased again in 2016; in the United States, renewable energy accounted for 60 percent of these additions. In 2016, Portugal powered the country with renewable energy alone for four consecutive days, clean power supplied Germany’s power demand for a full day, and Denmark could produce enough wind power to meet its domestic electricity demand and have enough to export power to Norway, Germany and Sweden. 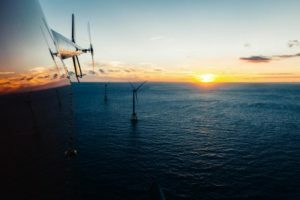 The U.K. generated more electricity by wind than coal – the first-time wind has outperformed coal for an entire year. In 2016, Hydro became visible as a storage solution and as an integrator of wind and solar. Small Hydro solutions grow as a source of electricity production close to the users. In 2016, the U.S. Department of Energy published a report stating that U.S. hydropower could grow from 101 gigawatts (GW) of capacity to nearly 150 GW by 2050. First, the demand for new energy supplies around the world keeps growing at a significant pace. During the first half of 2016, clean energy investments reached $116.4 billion, and approximately $2 trillion is invested in the global energy sector per year. Second, in many countries renewables can meet or even beat the cost of generation from conventional options. For example, in the United States onshore wind power is competitive with new natural gas-fired generation. Moving forward, GE’s research partner, the Joint Institute of Strategic Energy Analysis (JISEA) has estimated that by 2025, innovation will enable wind costs to fall by another 29 percent and solar PV costs to fall by up to 44 percent. Worldwide, Hydro is among the most competitive. Third, the renewable energy industry is a global jobs growth engine. Global renewable energy employment has reached 9.5 million and is increasing at a rate of 5 percent annually, which means that nearly 500 million new jobs are created every year. The greatest number of jobs are being created in the United States, China, Brazil, India, Japan and Germany. There is scope for even more optimism. Technology innovation and policy commitments could lead to a world where wind energy accounts for one-third of electricity generation by the middle of the century. These are not “pie in the sky” estimates. Rather, they represent the range of what’s feasible given the current pace of innovation across the industry. Scientists at GE’s Global Research Center have developed innovations that place wind power on a pathway to produce power at 3 cents/kWh. Innovation is not confined to wind and solar power– innovations in hydropower promise to increase efficiencies in hydropower plants across the globe. Innovations in hydropower efficiency are benefiting from the digital revolution. For example, GE’s Digital Hydro Plant is a unique blend of hydropower software and hardware, well-grounded in data analytics, and improving the performance of hydro plants across the globe. Data analytics provide greater accuracy about the performance of hydropower turbines, plants and equipment, which is helping control expenses and energy production. The rapid pace of change in renewable energy is an exhilarating journey. We are seeing the evolution of new business models and power players. There are new investment opportunities – we can combine wind, solar and hydropower to change traditional energy models. Innovation in wind, solar, hydro, storage, hybrid technology, energy efficiency and digitization enable us to run the biggest economies and reach the most remote communities. Just over 100 years ago, in a Scientific American advertisement, GE imagined a world where humankind could successfully harness the power of the sun, the wind and the sea. That vision, along with our relentless investment in technology innovation, has helped shape the renewable energy world that we live in today – imagine what the next 10 years will bring! Debora Frodl is Global Executive Director at GE Ecomagination. Yves Rannou is President and CEO for GE Renewable Energy, Hydro. This entry was posted in Uncategorized on May 2, 2017 by Charia Underwood.